Teens love summer break! Moms love a break from homework mayhem. Years ago most teens had the entire summer off to plan vacations. These days teens are taking summer classes to boost GPA or get a headstart on credits. They may attend a school with a year-long schedule. It can be very difficult for working parents to plan trips with children with these crazy schedules. We want our kiddos to have the same wonderful summer memories of our childhood. My fondest memories of childhood were road trips with my parents. We loved picnics at roadside rest areas, visiting the deepest well in the USA, Six Flags over Someplace, and soaking up some grandparent time in another state with my cousins. It seems simple right? To just jump in the car and go experience the world. Take a jet to a wonderful tropical island or to the happiest place on earth to visit the mouse? Working schedules and the stress of maintaining those grades and credits in while trying to figure out the landscape of getting into college and then paying for it makes summer vacation a tough thing to plan. Money, stress, grades, summer jobs, bother parents working, these are all factors to prevent a long break away from your city. 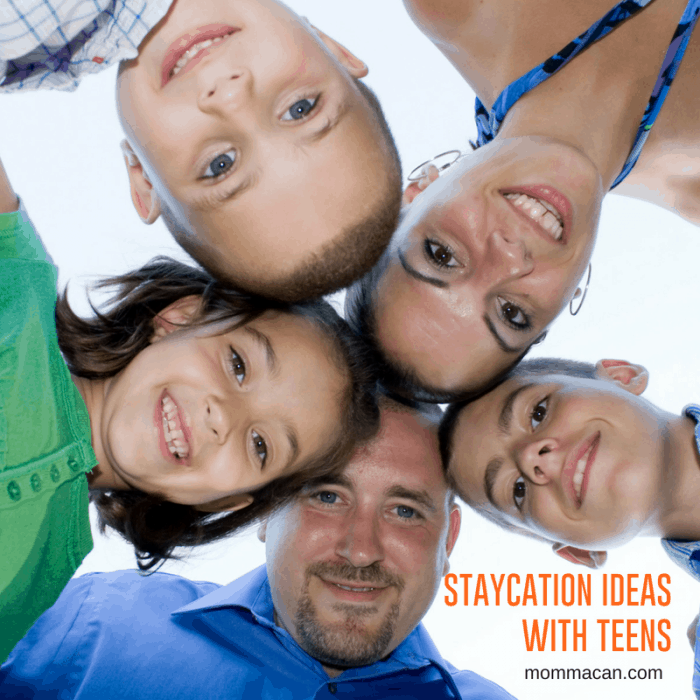 But you can still have a fun vacation with your teen, a Staycation! A staycation is a designated period of time families stay at home and participate in leisure activities within driving distance of their home without the need of an overnight stay. Decide in advance the days of your family’s staycation. Also, determine times without screen time and limited screen time. This includes the adults! Staycations also save money! Limited travel cost and no hotel fees! Set Ground Rules – The reason families schedule staycations its to spend time connecting! It is so important in the fast-paced world to maintain family relationships. Create A Plan – Schedule a family meeting to discuss staycation ideas and make sure to give a voice to all the children. Decide on a budget and then try to choose at least one idea from each family member. 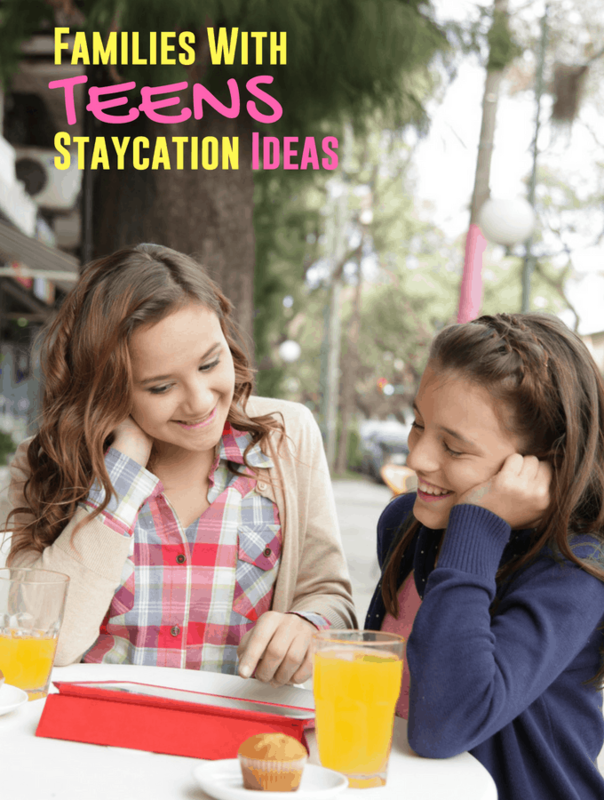 Create your schedule for the staycation including the list of ideas. Prepare The House – Yes, this is work for busy working parents! Everyone ( especially teens) that is old enough to help around the house needs to pitch in and get the house ready for the staycation. Change the sheets on the beds for that fresh linen smell! Get the eats ready! Organize some takeout menus, print from online or swing by the restaurants and grab a few. Buy some frozen pizzas, make ahead a cheesy lasagne, buy snacks for movie nights. Create a fun guest basket or gift box for the kids and maybe surprise your partner with one as well! Be Flexible – Teens are tired. Life is hectic and so busy for everyone and teens really do benefit from extra rest. Your teen probably things sleeping in on vacation is PART of vacation. If you are a busy working family this is especially true. Let teens have a few lazy mornings during your staycation time. Staycation ideas should always include downtime! This could be a wonderful opportunity for mom and dad to sneak out for a long morning walk and quiet breakfast. Movie Night – at home or at the local theatre. Map the closest driving excursion of your choice. Check out the local happenings. Concerts in the park, small town festivals, Church fairs. etc. The whole idea of the staycation is a positive family experience. Sleeping in and letting out teens choose a few parts of the family time is a great way for the family to bond and have a good time. Creating a positive atmosphere and even including a few surprises like a gift basket of pampering or special snacks as well as saying yes to a dinosaur filled with explosions teen favorite on movie night are a great way to ensure a great staycation! I totally plan to create a staycation for women. lol We need our RNR just like the kiddos! Great ideas. We’ve done several staycations and I love the guest basket idea. This summer we’ve been fishing a lot and plan on going geode hunting when it’s not scorching hot. That is so cool! My kid would love that, he collects rocks and minerals.